For feeding take a frozen bag out of the freezer and let it thaw at room temperature for a few hours (store it in your fridge, if it is intended to be given the next day, fresh, thawed food should not stand at room temperature for longer periods of time). Place it on a plate or get a plastic container to keep it in, such as the Lock & Lock Food Container, if you want to avoid any messes in your fridge or kitchen. Do not microwave the food. Neither, flat bags or the containers do not take more than a few hours to thaw. Press one half of the thawed food out of the bag in the morning, reseal it and feed and the other half in the evening, if your dog is used to being fed twice a day. Press one half of the thawed food out of the bag in the morning, reseal it and feed and the other half in the evening. 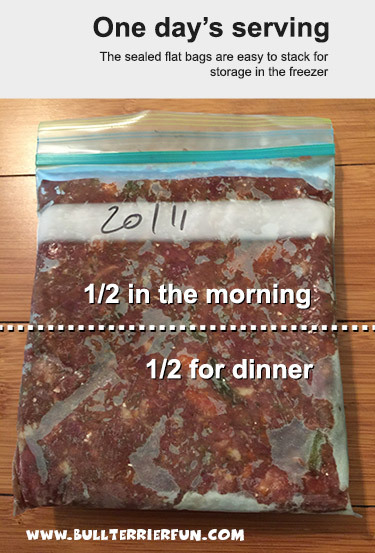 Remember to take another package for the next day out of the freezer for thawing. If you have not already added it to your batch during preparation, you can always add yogurt, cottage cheese, ACV, vitamins, fish oil or other additives as needed to the single servings when feeding them. Note: If you are switching your Bull Terrier or any other dog from dry food, you may want to make it a slow transition, in case you notice runny stools in your dog for more than 1 day after feeding raw for the first time. Some dog’s stomach reacts sensitive to changes and needs some time to adjust. In this case just feed half and half (kibble and raw) for about a week or two and then switch to completely raw. That should get your dog’s digestive system used to the change. This entry was posted in Diet, Nutrition and tagged Bull Terrier, Coat & Skin, health, homemade dog food, nutrition, raw dog food. Bookmark the permalink. ← Annoying Bull Terrier habits: Why does my dog always follow me? This is lovely! Right this can be consider as high quality food for our dogs, Homemade recipes for our dog foods are better than choosing some dog food brands.. Just saying. Can you please explain the quantities to me? Is it 30lb of meat in total of which 10lb must be chicken? In this recipe the only ingredient that is chicken are the innards (chicken hearts). That’s the 10lb. ADDING to it: The 30lb meats, which is ground beef. Of course you can substitute as you wish. If the dog needs to get some more calories, I recommend to choose meat with a higher fat content and not trimming the fat. Amazing blog.Thank you so much for sharing very easy homemade raw dog food recipe. It is a smashing one of a kind guide for discovering healthy recipes for dog food minus a headache. Thanks again. I have pomeranian boy. I know that grain are mixed into the dog foods to make the production cost cheaper. But unlike humans, dogs don’t have the molar teeth necessary to grind up the grains. This may lead to unproper digestion. Your recipe is grain free. thank you for recipe.